The Porcupine’s Quill | Book Listing | Bite Me! Joe Rosenblatt delights in revealing a fantastical hidden world of ravenous monsters and rapacious critters of all sorts—one in which ‘either you’re the eater, or the one who’ll be consumed’. In Bite Me!, idiosyncratic observations and provocative musings illuminate an unseen world of creatures both real and imagined. This is a collection populated by eighty-foot-long boa constrictors and carnivorous pitcher plants. Of colossal clams that inhale noxious volcanic fumes and of bioluminescent ocean-dwelling critters that appear as ghostly mermaids to unsuspecting submariners. It is a collection in which the unfortunate Monster Boy copes with the consequences of schoolyard bullying—and flesh-liquefying stomach acid—while the agoraphobic Birdman ‘strives to ascend skyward’ though he is permanently grounded. The poems and musings in Bite Me! are interested in ‘the bizarre side of Mother Nature’s handiwork’, from the depths of the ocean to the wilds of the tropical rainforest ... to the cozy hearth of the domesticated housecat. In this collection characterized by isolation and unquenchable need, Rosenblatt celebrates life in all its varied forms while awaiting that moment when ‘time drifting as a bottom feeder makes a meal of us’. Disgusting? Well, yes, but no. The language is so rich, the pace so exhilarating, the images so startling, and the wit so wry that one cannot pause for disgust. But are they there, those primeval super-snakes slithering about, who according to some researchers in herpetology are a mind-blowing eighty feet long with a girth of five or more feet—besting those present-day anacondas half that length with a girth, on average, of a mere metre? What especially provides a stimulant for the appetite of my hungry muse, more than snakes with lengthy trains, are pitcher plants who manage to lure small mammals to their deaths. To sustain those monsters, the poor devils end up liquefied as essential protein in their bellies. And as if this bent fascination in giant reptiles isn’t enough, I am earnestly interested in hearing about man-eating plants. As yet, I have not seen any scholarly articles in any reputable science journal having to do with those leafy carnivores preying on humans, but that doesn’t mean those floriated monsters, having acquired a taste for human flesh, aren’t around—waiting patiently for their next weighty meal in some steamy setting in the Amazon basin. In the meantime, I will settle for the commonplace: an octopus snacking on a seagull, or a Conger Eel going for the leg of a diver. What especially fascinates me and excites my ravenous muse is the marine life existing at the bottom of the deepest oceans, bioluminescent critters that appear like ghostly mermaids to mariners gazing through the window of their bathysphere. It borders on the supernatural, for what is one to make of those colossal clams inhaling the noxious fumes of an active volcanic chimney belching fire, or a lumbering gigantic squid approaching that bathysphere with the intention of embracing it with its sprawling tentacles? comfortably sheltered deep inside a briny cave. Gritting all his teeth—he was not a pretty sight. lashed out—tore off a generous hunk of meat. as he wriggled his body and beamed out a smile. ‘You’ve eaten him!’ shrieked the remaining limb. a stream of flesh, bits of bone, bristle, and blood. to an approaching monster who wore my face. ‘Joe Rosenblatt’s obsessive imagination powers on through his geriatric years. One would think that after decades of producing countless books of poems and drawing about creatures: ants, bees, snakes, frogs, crocodiles, fish, birds, trees (yes trust me trees), that Rosenblatt would become more subdued and less demonstrative in his old age. Not a bit. The poet in his old age is going out on his shield leaving behind a literary tapestry that evokes the juices of life the DNA in an array of outrageous creatures--some familiar some invented. ‘This is a zany compendium of prose poetry and brilliant sonnets (illustrated by the author’s drawings) that reveal an astonishing mind that examines every nook and cranny of eccentricity in the master’s repertoire and creates a collection of poems and drawings that reflect a dazzling view of the tribulations of the human condition in a world dominated by nature’s "mutants and their pals". A whole array of interacting creatures in everyday situations including a bizarre character named Monster Boy who zaps a protagonist with a "spray of sizzling stomach acid" that he secretes from his foot. 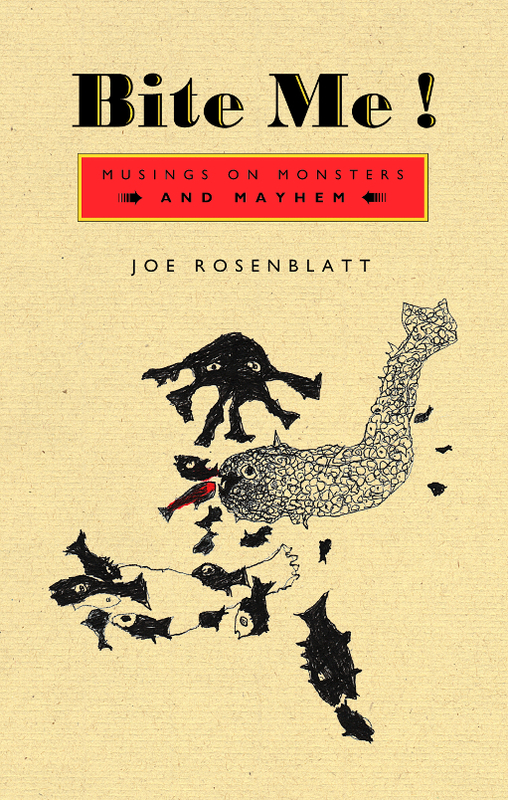 Joe Rosenblatt is an accomplished author and artist who, over the course of a five-decade career has produced over twenty books of poetry, fiction, non-fiction and visual art. He was the second poet to be published by Coach House Press, which released The LSD Leacock in 1966. 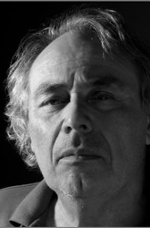 Rosenblatt has since received several major awards, including the Governor General’s Award for his poetry collection Top Soil, as well as the B.C. Book Prize for Poetry Hotel in 1986. He lives in Qualicum Beach on Vancouver Island.